By maintaining a correct cutting height of 2 1/2 – 3 inches, two objectives are accomplished. First, it conserves water needs by shielding and cooling the root soil area. Second, turf is stronger, thicker and healthier because grass blade areas carry on major functions of growth. A taller grass blade encourages better root growth to help stimulate new grass plants thickening the turf. Mowing frequency is critical; mow at least once a week and never cut off more than 1/3 of the leaf blade at any one time. It is wasteful to always catch clippings and waste nutrients. Clippings decompose rapidly and return those nutrients to the soil. 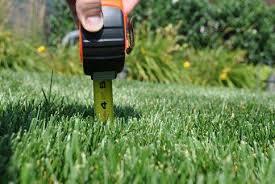 A lawn mowed at the proper height will better absorb clippings. Don’t forget to keep your lawn mower blade sharp. A dull mower blade rips and shreds the grass blades instead of cutting cleanly. An open wound on the grass blade left by shredded tips leaves a ragged appearance, is slower to heal and leaves the lawn under more stress during the heat of summer.